Karl-Heinz Schwarte comforted his wife, Man-Hee, after dropping a bouquet in memory of their late son, Dr. Sebastian Schwarte, off Long Island. The 12:15 MBTA ferry was idling at Long Wharf the other day as Karl-Heinz Schwarte and his wife, Man-Hee, made their way down the metal gangplank. “Guten Tag,” said Denis Kinneen, one of the crew members, greeting them warmly in their native German. They smiled and shook hands with Kinneen, then made their way to one of the tables near the back of the boat. They carried a small bouquet of roses and baby’s breath in a plastic shopping bag. Mrs. Schwarte carried some stuffed animals. Nine years ago, Sebastian Schwarte left his home and parents in Hannover, Germany, and took up a postdoctoral fellowship at Massachusetts General Hospital doing cancer research under Dr. Megan Sykes. The Schwartes flew in from Germany and Dr. Sykes showed them around Cape Cod. They loved it. They spent New Year’s with their son at the First Night celebration in 2007. Sebastian Schwarte liked everything about Boston, and he especially loved the harbor islands, the way the city rose up, like Oz, at the water’s edge. The next day, on Sept. 19, 2008, Dr. Sebastian Schwarte hopped on a treadmill at Mass. General for some exercise. Dr. Sebastian Schwarte was 32 years old. The Schwartes thought long and hard on the long, hard flight from Germany about where their son should rest. Seven years ago, after a memorial service at Mass. 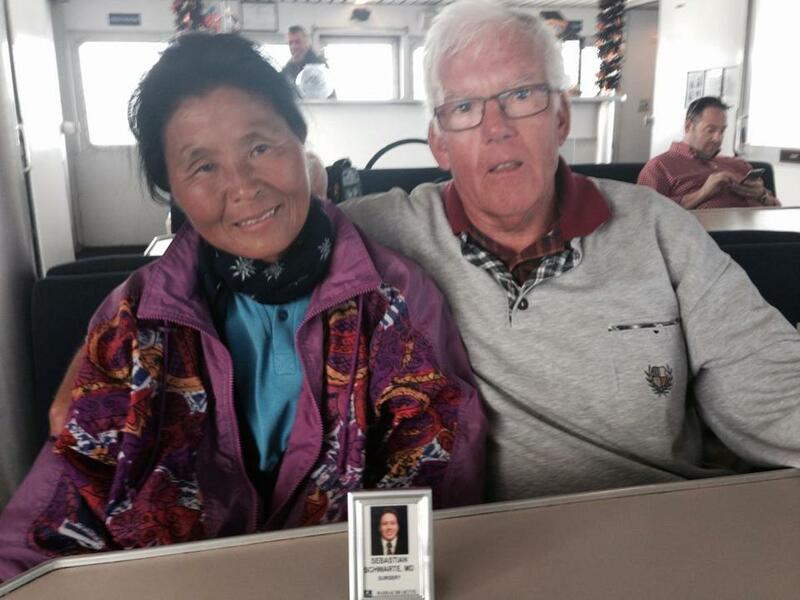 General, Karl-Heinz and Man-Hee Schwarte took the ferry out of Long Wharf carrying their son’s ashes. 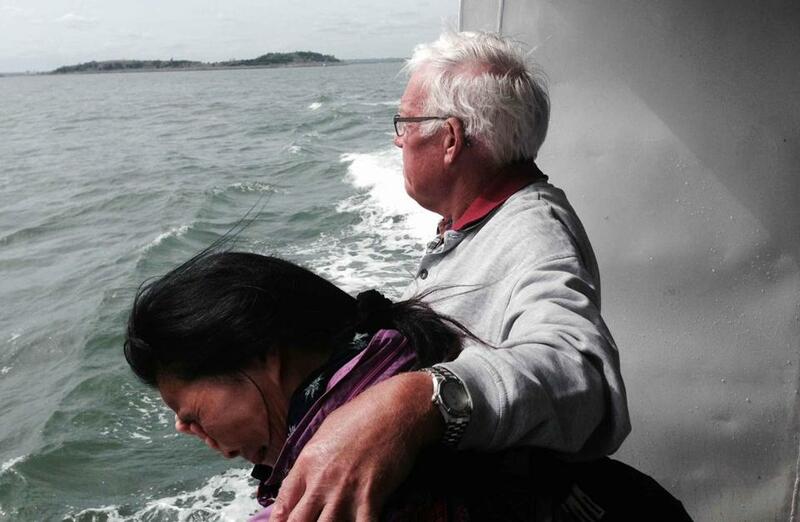 As the boat passed Long Island, they scattered the ashes. Every year since then, the Schwartes have come back to Boston in September. They take the ferry every day for a week, from Long Wharf to Hingham and back again. On every trip, they drop flowers in the ocean where they scattered Sebastian’s ashes. Every time the flowers hit the water, Man-Hee Schwarte cries for their only child. And every time she cries, her husband puts a comforting arm around her shoulder. “The crew have come to know the Schwartes over the years, and out of respect we make sure to give them a slow bell when passing the spot where they place the flowers in memory of their son,” Denis Kinneen said. The other day, as the Schwartes talked about their son, another member of the crew, Scott Underdown, appeared at their side with bottles of water. They hadn’t asked for the water. They didn’t need to. Karl-Heinz Schwarte retired from a medical organization where he was financial officer. His wife emigrated from Korea to Germany to work as a nurse. They wonder what Sebastian would have done had he lived. Whether his research would have saved lives. They think about the grandchildren they never had. And they long for an only child who died far too young. Mr. Schwarte is 69. His wife is 63. They are both in good health, but they’ve decided already that when they die, they, too, will have their ashes spread in the waters off Long Island. And then their family will be together again, forever. Man-Hee and Karl-Heinz Schwarte with a photo of their son.